Since 2013, Strasbourg has tried to escape its fate as “the Christmas city” to become the city of lovers as well! That’s fitting, for anyone who has ever strolled down its streets in good company will be able to confirm it’s a nice place to be in as a couple. Plus there are many charming places around that are perfect for beautiful declarations. Thus, the municipality started the “Strasbourg mon Amour” event (meaning Strasbourg My Love if you wondered) which consists in ten days of Love celebration. Aside from the official program that you can find online (February 8th to 17th 2019), we thought it would be a good occasion to cook up a romantic tour of the city for you. From there, get down to the quai de la Bruche. Next to this magnificent Plane tree (the famous French platane), you can discreetly say that your love shall be as long lasting as this tree (352 years, not to bad eh). Take one small street or the other in front of you and get to the Rue du Bain aux Plantes. Follow it straight ahead into the heart of the Petite France: the Benjamin Zix square. Just look around and let yourself be inspired by the beauty of the area to compliment your sweetheart. This is also a good place to show how your heart burns with love for the other (but be careful with that, the district burned down several times already). 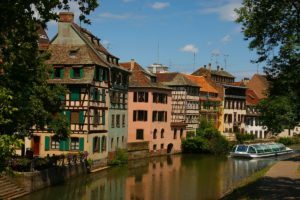 Pro tip: do not evoke the origin of the name “Petite France” ever during this tour (and if you don’t know about it yet, come to one of our walking tours and we’ll tell you why). Then take the (tiny) rue des Cheveux, a good place for a secretive kiss away from inquisitive eyes. Once on the Meuniers square, get to the Grand rue and follow it in the cathedral’s direction. A bit further down the street, to your left, take the rue du Savon. If you feel inclined to do so, have a drink at Les Savons d’Hélène, a charming and discrete bar. Now’s the time to slowly get to the end of the tour. Follow your instinct to get to the cathedral. My recommendation would be: rue Sainte-Hélène, rue de la Demi-Lune, rue du Seigle, a small portion of the rue des Grandes Arcades and, at last, the rue des Hallebardes. Be prepared for a striking view! Galvanized by our magnificent Lady of Strasbourg, so proudly standing, the last walking efforts will be a breeze. Go to the place du Château, then to the terrasse Rohan and cross the bridge. The last part of the tour takes you through the lovely rue Sainte-Madeleine. It is the best time to reminisce about the fond memories you have together, for a bit of sweet nostalgia never hurts. 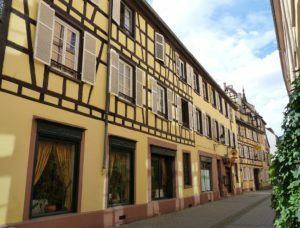 At the end of the street, you will be on the place des Orphelins, in the Krutenau district, and you should not have any trouble finding a good restaurant there. What you will find there: culinary specialities from South-West France, and it’s even better than the real deal, as crazy as it sounds. If you are lucky, you may even get to eat in the Ancient Chapel that gives its name to the restaurant. No more than 6 people at a time in that one, isn’t that so very romantic?